It looks like something straight out of a child’s wildest dreams: a tiny house filled with swings, slides, tumbling mats, and play equipment galore. The house, which is only 30 feet long and 8 feet wide, sits atop a gooseneck trailer and is pulled by a large, black truck. 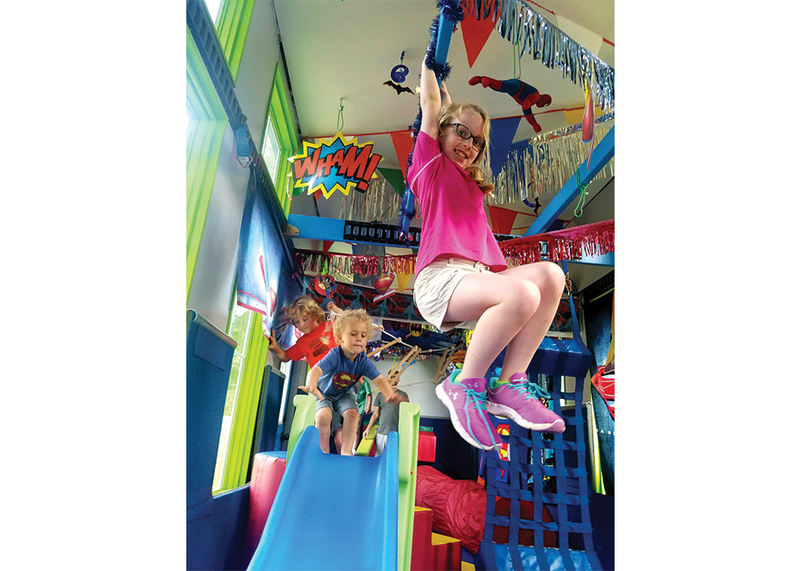 The owners of this creation have dubbed it the “Tiny Gym,” and they’re ready and willing to bring it right to the doorsteps of schools and daycares across South Carolina. The Tiny Gym is definitely one-of-a-kind. “You can explain and describe it to people, but they don’t really understand until you show them pictures,” said Mitzi during an interview with B&W. Mitzi and Jeremy tow their Tiny Gym with a B&W Turnoverball gooseneck hitch. They’re very pleased with the versatility the Turnoverball gives them. “With the truck and the hitch, you can unhook the trailer, flip the hitch over, and you have a truck with a flatbed that you can use for your family,” said Jeremy. This business might sound daunting, but the Mitzi and Jeremy aren’t intimidated; they have plenty of support and konw where to go if they need advice and support. Mitzi’s parents, Kitty and Dan Perkins, own and operate a business called TUMBLEBUS which is very similar to GO Play. The Perkins teach fitness classes for kids inside their 6 Tumblebuses, or school buses that have been converted into mobile gyms. “The idea for our Tiny Gym came from my parents,” Mitzi explained. Jeremy and Mitzi worked with Mitzi’s parents at TUMBLEBUS for several years, and during that time they developed the idea for their own Tiny Gym. “We loved the idea of the Tumble Buses, but I’m a taller guy and I wanted something that I could stand up straight in without hitting my head,” Jeremy explained. That’s where the tiny house idea came into play. So, Jeremy asked himself, why not transform a tiny house into a mobile gym for kids? Getting their business and Tiny Gym to this stage of functionality been a long process. Mitzi and Jeremy hired a contractor to build the outside of their tiny house and then customized the inside themselves. However, Mitzi explained that the real challenge came with insuring it. Once the Mitzi and Jeremy start spreading the word about their Tiny Gym, it’s bound to give the traditional playground a run for its money. “The equipment at playgrounds is fixed and kids see the same things every day. With our gym, the kids can move things around and we can switch out our equipment,” Jeremy explained. The fact that the gym is in a separate facility from the schools is also beneficial. Children can play and be loud in the Tiny Gym while other kids are inside the school napping. This often provides a well-needed break since the children are expected to be quiet while indoors. Parents and teachers also noticed a positive difference in their children. The children were more willing to get ready for school on the days when the Tumble Bus was coming, and after workouts they had better focus and concentration in the classroom. They’ll also use their gyms for charitable purposes and will set up for free play at community fundraisers, festivals, and fun runs. Going to these events will give their business good publicity as well. To learn more about GO Play and the Tiny Gym, visit https://www.goplayfitness.com/ or like the GO Play Facebook page at https://www.facebook.com/GOPLAYfitness/ .